Cromer is a busy and popular seaside resort on the North Norfolk coast, and it was a prosperous medieval town, although its heyday came in the 19th century when the town became well known as a resort. A large number of prehistoric flint implements have been found in the parish throughout the 19th and early 20th centuries, including Palaeolithic flakes (NHER 6432, 6433 and 6434), Neolithic axeheads (NHER 6438, 6444 and 12765), and a Neolithic arrowhead (NHER 14570). Bronze Age palstaves (NHER 6446 and 6450), a socketed axehead (NHER 6447) and a spear (NHER 6449), all made of copper alloy, have also been found. During the 1950s several Iron Age pots (NHER 6452) were found, and the site was excavated by Norwich Castle Museum, producing more Iron Age pottery (NHER 6452). Several Roman coins have been found in the parish (NHER 6453, 6454, 6455 and 33127), but no evidence has as yet been found of an Iron Age or Roman settlement at Cromer. 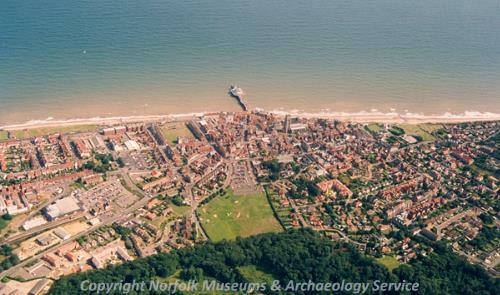 Cromer is not mentioned in the Domesday Book, and only one Saxon artefact has been found in the parish; a Late Saxon or Viking spearhead (NHER 6456). As the nearby town of Shipden gradually slipped into the sea, Cromer grew in importance. The name Cromer is recorded from the 13th century, meaning ‘lake frequented by crows’. During the medieval Cromer became a thriving coastal town; its wealth reflected in the magnificent church of St Peter and St Paul (NHER 6475) that dominates the town centre. The church has the highest tower in Norfolk, and is lavishly decorated in the Perpendicular style. Hanover House (NHER 17198), or Shipden House, which stands opposite the church, is the only surviving medieval building in Cromer, and is a house of about 1500 concealed by an 18th and 19th century brick façade. A 16th century ceiling was uncovered in the house in the 1980s. Medieval pottery (NHER 6457, 18062 and 29558) and a silver coin (NHER 6458) have also been found in the parish. One of Cromer’s townsmen, William Crowmere, became Lord Mayor of London in 1423, whilst another, Roger Bacon, is said to have re-discovered Iceland at the end of the 15th century. During the post medieval period Cromer continued to flourish, and during the 18th and 19th centuries it became popular as a seaside resort. In ‘Emma’, published in 1816, Jane Austen mentions Cromer as ‘the best of all the sea-bathing places. A fine open sea… and very pure air’. In 1877 the railway arrived in Cromer, bringing more tourists and holidaymakers into the town. The poet Clement Scott gave the name ‘Poppyland’ to the cliffs above Cromer, an image immortalised in early railway posters. It was during the 19th century that many of the imposing houses and hotels in the town were constructed, including Chesterfield Lodge and Villas (NHER 33458), designed in the ‘cottage ornee’ style, the Cliftonville Hotel (NHER 39765), and Cromer Hall (NHER 6476), which was rebuilt in 1829 in Gothic Revival style on the site of an earlier building. Cromer Hall Park (NHER 33460) was landscaped around the Hall in the 19th century, although the medieval and post medieval field boundaries of the pre-park landscape are visible as earthworks within the park. Cromer lighthouse (NHER 14457) was rebuilt in 1833 to replace an earlier lighthouse that was lost to erosion. In 1897 the Gangway (NHER 17567), which had been originally constructed earlier in the 19th century was extended and widened, created an impressive raised road with flint retaining walls to improve access to the beach. The sea wall (NHER 39576) was also built in the 19th century, and in the early years of the 20th century the promenade was built, and large concrete bastions added to the sea wall. 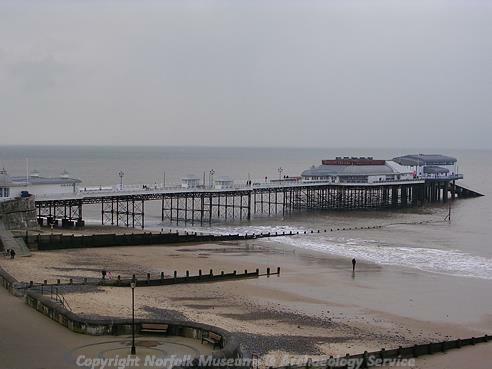 Cromer Pier (NHER 39328) was built in 1900, and is still one of the main attractions for visitors. 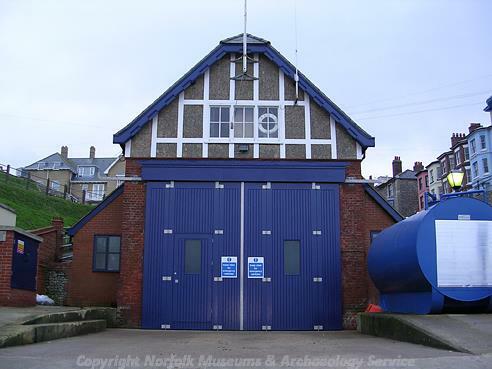 The RNLI lifeboat station was added to the rear of the pier in 1996, continuing Cromer’s proud lifeboat tradition. Some of those who lost their lives at sea, as well as several lifeboat men are commemorated in Cromer cemetery (NHER 33459), where some of the headstones are decorated with carvings of ships and the Cromer lifeboat. During World War Two Cromer was heavily protected from the threat of German invasion, and aerial photographs taken by the RAF in the 1940s show the large number of pillboxes (including NHER 38833, 38849 and 38857), gun emplacements (NHER 38834 and 38835), searchlight batteries (NHER 34406), and air raid shelters (NHER 40659, 38829 and 38826) on the seafront, as well as the Cromer Coastal Battery (NHER 32566). Several pillboxes (NHER 38850 and 38858) on the seafront were disguised as ice cream stands! Sarah Spooner (NLA), 24 October 2005.